Shigeru Mizuki (水木 しげる, Mizuki Shigeru, March 8, 1922 – November 30, 2015) was a Japanese manga author and historian, best known for his series GeGeGe no Kitarō (Japanese: ゲゲゲの鬼太郎, literally "spooky Kitarō") – originally titled Hakaba Kitarō (Japanese: 墓場鬼太郎, literally "Kitarō of the Graveyard") – Kappa no Sanpei, and Akuma-kun. Born in a hospital in Osaka and raised in the city of Sakaiminato in Tottori prefecture, he later moved to Chōfu, Tokyo where he remained until his death. His pen-name, Mizuki, comes from the time when he managed an inn called 'Mizuki Manor' while he drew pictures for kamishibai. A specialist in stories of Yōkai (妖怪, traditional Japanese monsters, ghouls, and goblins), he is considered a master of the genre. Mizuki was also a noted historian, publishing works relating to world history, Japanese history, and his own World War II experience. Mizuki was born Shigeru Mura (武良 茂 Mura Shigeru) in the city of Osaka, the second of three sons. He was raised in the coastal city of Sakaiminato 境港, where he spent much of his childhood as a 'scrapper': picking fights and participating in childish warfare with the neighbouring children. He displayed from an early age a particular talent for art. During his time in elementary school, Mizuki's teachers were so impressed by his skills with a pencil that they organised an exhibition of his work, and he later went on to be featured in the Mainichi newspaper as something of an artistic prodigy. In addition to this penchant for the artistic, Mizuki had an interest in the supernatural - something that was fueled by listening to ghost stories told by a local woman named Fusa Kageyama, but whom the young Mizuki nicknamed "Nononba". However, in 1942, he was drafted into the Imperial Japanese Army and sent to New Britain Island in Papua New Guinea. His wartime experiences affected him greatly, as he contracted malaria, watched friends die from battle wounds and disease, and dealt with other horrors of war. Finally, in an Allied air raid, he was caught in an explosion and lost his dominant (left) arm. Regarding this life-changing event, a Nov. 30, 2015 NHK announcement of his death showed excerpts of a video interview with him at age 80, in which he said that as the only survivor of his unit, he was 'ordered to die' — a prospect he considered ridiculous. The result of Mizuki's wartime experience was a concurrent sense of pacifism and goodwill. In the same interview, he explained that his Yōkai characters can be seen only in times of peace, not war, and that he purposely created these supernatural creatures to be of no specific ethnicity or nationality as a hint of the potential for humanity. While in a Japanese field hospital on Rabaul, he was befriended by the local Tolai tribespeople, who offered him land, a home, and citizenship via marriage to a Tolai woman. Mizuki acknowledged that he considered remaining behind, but was shamed by a military doctor into returning home to Japan first for medical treatment to his arm and to face his parents, which he did reluctantly. 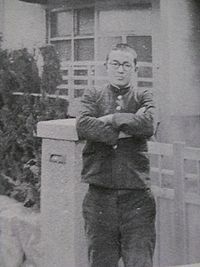 Upon arriving home, Mizuki had initially planned to return to New Guinea; however, the occupation of Japan changed that. His injuries did little to help, nor did the fact that his older brother, an artillery officer, was convicted as a war criminal for having prisoners of war executed. After his return to Japan he worked at a variety of jobs including as a fish salesman and kamishibai artist. In 1957, Mizuki released his debut work, Rocketman. He published numerous works afterwards, both dealing with the military and with yōkai. He has also written many books on both subjects, including an autobiography about his time on New Britain Island and a manga biography of Adolf Hitler in 1971.This book was published in English in 2015 by Drawn & Quarterly. In 1972 he publishes the gekiga graphic novel Nonnonba about his grandmother. In 1991, he released a short work titled War and Japan (Sensō to Nippon) published in The Sixth Grader, a popular edutainment magazine for young people, detailing the atrocities committed by the Japanese Army during their rampage in China and Korea and is narrated by Nezumi Otoko. The work serves as a powerful counterpoint to revisionist manga like the works of Yoshinori Kobayashi and by extension a way for Mizuki to express his anger at those responsible for all of Japan's victims. From 1989 till 1998 he works on the series Showa: A History of Japan following the same approach and describing the Showa history combined with personal anecdotes. In these books Nezumi Otoko is also the narrator. When not working in either field, he painted a number of subjects, though these works are not as well known as his literary ones which have made him a household name. In 2003, he returned to Rabaul to rekindle his friendship with the locals, who had named a road after him in his honor. In 2005, Mizuki appeared in a cameo role in Yōkai Daisenso ("The Great Yokai War") directed by Takashi Miike, a film about Yōkai inspired by his work as well as the work of Aramata Hiroshi. He appears towards the end of the film in the role of the Great Elder Yōkai: a pacifistic character who condemns the warring ways of the film's antagonist and reaffirms the role of Yōkai as peaceful, playful creatures. A brief explanation about his works also is mentioned in the film. In 2010, NHK broadcast an asadora about his married life, Gegege no Nyōbō, based on his wife's autobiography. On November 30, 2015, Shigeru Mizuki died of heart failure in a Tokyo hospital after collapsing at his home from a heart attack. Mizukis work remained for a long time unknown outside Japan, due to not being translated. Around 2010 started publishing his Showa, Kitaro, Nonnonba and Hitler, also French, Italian and Spanish publication sppeared shortly afterwards, leading to an increasing interest for his work (and that of his gekiga peers) among the Western graphic novel audience. Sakaiminato, Mizuki's childhood home, has a street dedicated to the ghosts and monsters that appear in his stories. One hundred bronze statues of the story's characters line both sides of the road. There is also a museum featuring several of his creations and works. 1965 Received Kodansha Jido Manga Award for Terebi-kun (テレビくん?). 1990 Received Kodansha Manga Award for Komikku Shōwa-Shi. 1991 Received Shiju Hōshō Decoration. 1995 For the 6th Annual Tokyo Peace Day, he was awarded with an exhibition of his paintings, entitled "Prayer for Peace: Shigeru Mizuki War Experience Painting Exhibition"
1996 Received Minister of Education Award. 1996 His hometown of Sakaiminato honored him with the Shigeru Mizuki Road, a street decorated with bronze statues of his Ge Ge Ge no Kitaro characters and other designs relating to his works. 2003 Received Kyokujitsu Shō Decoration. 2003 Sakaiminato honored him again with the Shigeru Mizuki International Cultural Center. 2003 Tezuka Osamu Cultural Prize Special Award for his works. 2007 Received the Best Comic Book award for NonNonBā at the Angoulême International Comics Festival. 2010 Received the Person of Cultural Merit award. The Miraculous Notebook (不思議な手帖, Fushigina Techō, 1973) — a one-shot published in the magazine Comic Mystery about a notebook that killed whoever's name was written in it. The same idea was used in the smashhit manga Death Note by Tsugumi Ohba and Takeshi Obata. Although this fact is a coincidence, Ohba has stated he did not have any particular inspiration for his story. Yokaï, Éditions Cornélius, 2017, full color, hardcover, 80 pages. Illustration book. ^ a b c d e "The Life and Death of Shigeru Mizuki, 1922-2015 The Comics Journal". www.tcj.com. Retrieved January 8, 2016. ^ a b c Otake, Tomoko (February 6, 2005). "Drawing on experience". The Japan Times. Retrieved March 16, 2014. ^ Mizuki, Shigeru (2014). Showa 1944-1953: A History of Japan. Showa: A History of Japan. 3. Drawn & Quarterly Publications. p. 284. ISBN 978-1-77046-162-8. ^ Penney, Matthew (September 21, 2008). "War and Japan: The Non-Fiction Manga of Mizuki Shigeru". The Asia-Pacific Journal. Japan Focus. Retrieved December 1, 2015. ^ Haunted Travelogue: Hometowns, Ghost Towns, and Memories of War on JSTOR. JSTOR 41510934. ^ "Kitaro, NonNonBâ Manga Creator Shigeru Mizuki Passes Away". Anime News Network. November 29, 2015. Retrieved December 1, 2015. ^ Joel Hahn. "Kodansha Manga Awards". Comic Book Awards Almanac. Archived from the original on August 16, 2007. Retrieved August 21, 2007. ^ "Shigeru Hall to Open". Anime News Network. March 3, 2003. Retrieved February 13, 2013. ^ "2003 Tezuka Award Winners". Anime News Network. April 24, 2003. Retrieved February 13, 2013. ^ "Non Non Ba to Ore Wins "Best Comic Book" Award". Anime News Network. August 2, 2007. Retrieved February 13, 2013. ^ "Nobelists Suzuki, Negishi get Order of Culture". The Japan Times. October 27, 2010. Retrieved December 1, 2015. ^ "About Me". 百物語怪談会 Hyakumonogatari Kaidankai. Retrieved January 7, 2016. ^ "The Origin of Death Note?". ComiPress. January 8, 2007. Retrieved December 1, 2015. ^ "Tsugumi Ohba Talks about Inspiration for Death Note and Justice". ComiPress. January 15, 2007. Retrieved December 1, 2015. "Drawing from Experience", Japan Times, February 6, 2005, retrieved March 22, 2012. Thompson, Jason (May 3, 2013). "Jason Thompson's House of 1000 Manga Shigeru Mizuki". Anime News Network. This page is based on the Wikipedia article Shigeru Mizuki; it is used under the Creative Commons Attribution-ShareAlike 3.0 Unported License (CC-BY-SA). You may redistribute it, verbatim or modified, providing that you comply with the terms of the CC-BY-SA.